Drawing on observations and interviews with families, doctors, and policy actors, Timmermans and Buchbinder have given us the first ethnographic study of how parents and geneticists resolve the many uncertainties in screening newborns. Ideal for scholars of medicine, public health, and public policy, this book is destined to become a classic in its field. Chapter 4. Is My Baby Normal? Chapter 6. Does Newborn Screening Save Lives? "Smart, humane, and beautifully written, Saving Babies? is respectful but critical of clinicians, parents, and policymakers as it vividly connects the reader to the human tragedies on the page. Without being maudlin, Stefan Timmermans and Mara Buchbinder show us how newborn screening really works. Despite the grim subjects, this profound book is a real treat to read." "Recently expanded newborn screening for genetic disorders aims to enhance one of the triumphs of public health, right up there with vaccination and sanitation. But with millions of babies screened each year in all fifty states, one can lose sight of the fact that each family’s situation is unique and that their perception of the screening program – its benefits, its anxieties, its unpronounceable disease names—will differ. Stefan Timmermans and Mara Buchbinder capture those individual stories with sensitivity and compassion. The clinical scenarios they describe, all true, are fascinating and eye-opening, revealing attitudes and responses by both the families and their physicians that are often quite unexpected, but always poignant." 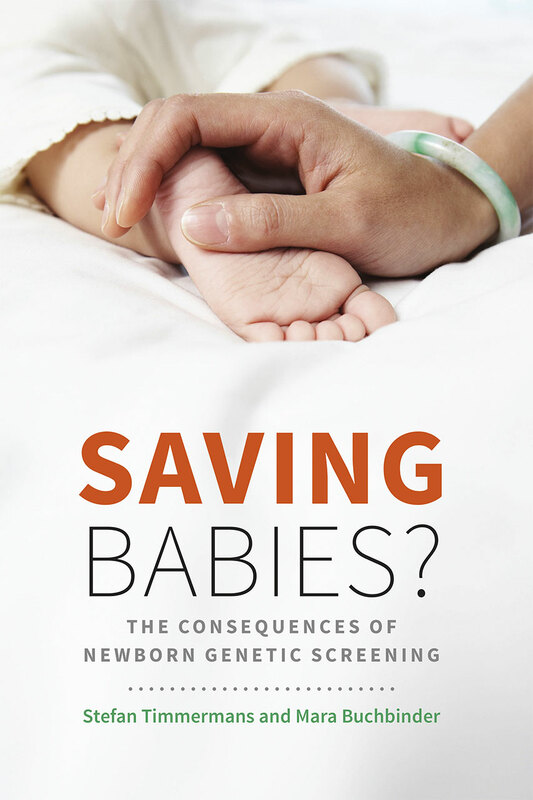 "In this sophisticated and grimly fascinating analysis of the social realities of newborn screening, Stefan Timmermans and Mara Buchbinder describe our brief experience with newborn genetic screening as a natural experiment, a sampling device illuminating the complex relationships among policy, technology, clinicians, medical institutions and medical advocacy—and their very powerful effect on patients and practitioners. As we have become all too well aware, technological progress can create new problems as it promises solutions to old ones. Saving Babies? should be of interest to anyone seriously concerned with health policy and the human condition in the twenty-first century."